St. Patrick’s Day is coming up, and for Okinawa City, the celebration promises to be very special, indeed. A St. Patrick’s Day Parade is set for Chuo Park Avenue, the first time it has ever been done. Okinawa City, together with local Paddy Mac’s Irish Pub owner Martin McIntyre, will host the parade starting at 3pm on Saturday, March 17th. The parade will be led by a group of bagpipers, as well as a marching band, winding its way between Morrigan’s and the Post Office on Chuo Park Avenue. Organizer McIntyre says anyone can join the parade, as it isn’t necessary to be Irish or have an Irish background. Applications are available now at Paddy Mac’s Irish Pub. McIntyre says the only requirement for parade participation is wearing something green, such as jackets, scarves, ties or hats. In order to make the parade a smashing success, McIntyre encourages potential participants to register as soon as possible. Live music and other entertainment will be presented in the open space across from the Park Avenue Parking Lot. Musicians on stage will be The Islanders, an Irish music band, Shima-Gais, the house band at Al’s Place on Gate 2 Street, Abiroji, a local rock band, and Sanshin performers. There will also be street dances, a clown show and karate demonstration. “Last year,” says McIntyre, “we of course celebrated St. Patrick’s Day at the Paddy Mac’s Irish Pub, but this year we’ve much more than that. We want to celebrate together with all the neighbors on Chuo Park Avenue. McIntyre, an Ireland native who’s been on Okinawa more than ten years, says there will be plenty of authentic Irish food offered throughout the day. McIntyre does the cooking himself at Paddy Mac’s, and will be serving up corn beef and cabbage dinners over the weekend, as well as traditional Irish beef stew. 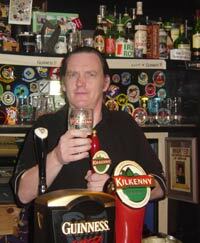 There is, of course, a steady flow of Guinesss and Kilkenny pints of beer throughout the holiday festivities.